The foreigner is not necessarily an enemy, the local and the foreigner can become friends and it is no necessity that the local’s or the foreigner’s intention is to cheat each other. The Austrian movies we selected show a variety of methods and aesthetics how to approach society. They are not mainstream, made to be sold as products fitting to the global entertainment market. They address the concerns we all have about the changes of the world in a very individual way. They span from professional movies which are classically produced up to art house movies which have neither beginning nor end. Some also neglect the usual narration. Like "Core of the Flock" or "Kafkanistan" are more artistic performative works where artists themselves taking part in front of the camera. Some movies speak with a strong visual language, showing the hidden, others show people in their irritation towards the world today. Questions are welcome – where is the way out, only through hard work and little money? By selecting these movies, we try to show how some Austrian directors represent and capture the unknown. Our intention is not to promote the East or the West, or democracy, we promote the view on people living here and there. We do not question the motives of each individual director; we let the images speak for themselves. The world is a global place, market place, work place, living place, a place to love and to die, to give birth to the new or to build something. As In the movie "Follow me", the other side of idyllic family life is shown; with people`s desires, their searching for change and emancipation. People have desires; their lives being increasingly forced into a global shopping mall, the consumerist way of life has become the super star – shopping mall, shopping for trees, rare earth metals, shopping for the cheapest t-shirt, for orang utans, for water and fields, or oil and iron. People’s relationships are based on economical benefit, the shopping mall is a global mindset of selling and buying and nothing else. Economically motivated small talk leads to boredom and dullness – who cheats who? Luxury and design are predators and the caretakers of the subtle corruption of men and women, mechanical and sportive. There is no deeper meaning inside them besides getting the bills paid. Such a fabric of society exchanges only the common interest in tax and parking tickets cheating. People live in the global space sharing one planet, but all are living on different timelines, different histories, different confusions – and their evolution speed is not synced. Some can shop for more and some not. Big political and religious mappings have outlived their expiration date but still remain in place, maintaining and, for the better or worse, defending their positions. As more and more global processes – financial, economical, health, environment – become critical, the local governments have little experience in acting globally. We are still acting like in postwar times, where the battlefield was shifted to economic wars between neighbours. This shift belongs to past times and has expired, not because it failed but because the global became really global, the virus does not ask for a visa to cross national borders. 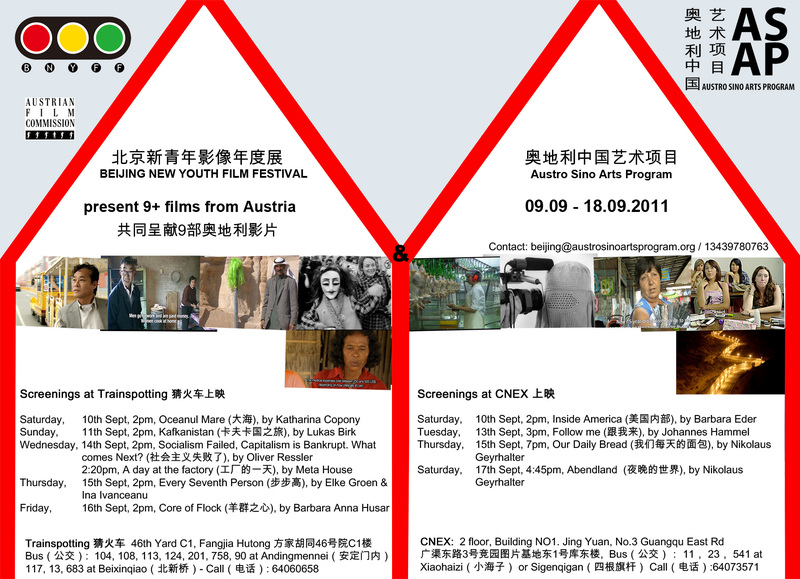 The Austrian movie selection opens several windows out of many onto one world. The movie "Inside America" shows how paradise can be brutal and a naive illusion, even to the extent that it does not become desirable to go for. People and races mix, and people live far away from their place of birth, they try to adopt and live their own culture openly, in an alien environment, like in the movie "OceanMare". Only if economical hardship and greed impacts, intolerance strikes. Sometimes changes happen faster than any planning can foresee. The movie"Socialism failed, capitalism bankrupt, what comes next" addresses these changes. Confucianism followed the teachings of Tao. Do Confucianism and capitalism fit better together than Christianity and capitalism? And what about Islam and socialism? The movies "Our daily Bread" and "Abendland" shows how we can survive in cities – we need to eat, we need to feel safe, we need to safeguard the cities from intruders and an unemployed young generation that has fallen out of the social frame work. The movie "Every 7 person is a farmer", addresses the tension between cities an rural areas. The wealth of the industrial nations is built on the farmers’ shoulders, on their hands digging the earth. It’s time to pay back and improve the farmers’ lives. Liberation does not necessarily go along with prosperity, democratization and free speech can turn out highly disappointing. The movie "A day in the factory" shows how big money is installing itself on borders, in grey zones of law; large scale sweatshops are touring the world, looking out for the cheapest labor to maximize profits. Most of the time women are exploited in the workforce because the little they get is more than nothing. No one can make everyone rich and happy. The West has built its present living standard on the exploitation of the rest of the world. We in the West are living surrounded by nations we used to enslave and exploit in past times. Now others claim the right to do the same. The selected movies show this and make you aware of this, so that everyone can find his or her individual window to look through and see and observe what he or she can understand and wants to understand.